Companion Child and Parent Interviews are designed to help you diagnose children with emotional disorder, where anxiety is a prominent component. Problem behaviors and diagnoses include school refusal behavior, separation anxiety, social phobia, specific phobia, panic disorder, agoraphobia, OCD, and PTSD. Assessment of ADHD allow for differentiation of inattentive type, hyperactive-impulsive type, and combined type. Interview questions in the Child Interview are specifically designed to be sensitive and understandable at varied age levels. The Child and Parent Interview Schedules for the ADIS for DSM-IV:C are each semistructured interviews organized diagnostically to permit differential diagnoses among all of the DSM-IV anxiety disorders. In addition, sections for assessing mood and externalizing disorders are included to allow comprehensive assessment of a child's full diagnostic picture. These sections are particularly important for evaluation of comorbidity patterns that often accompany anxiety disorders. The diagnostic sections of the Child and Parent Interview Schedules allow sufficient information with which to formulate a thorough treatment plan for the child's presenting problems. The Child and Parent Interview Schedules both contain comprehensive sections for assessing the functions and patterns of school refusal behavior, a serious behavioral complication often accompanying anxiety disorders in youth. Screening sections have been included in the Interview Schedules for assessing substance abuse, psychosis, selective mutism, eating disorders, somatoform disorders, and specific developmental and learning disorders of childhood and adolescence. This item includes one clinician manual. Interpersonal Psychotherapy (IPT) is a brief treatment approach that has demonstrated effectiveness for treatment of major depressive disorders in adults. 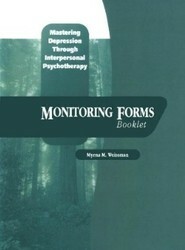 IPT takes the position that although there are many causes for depression, understanding the current social and interpersonal circumstances of the client associated with the onset of a recent episode of depression will expedite understanding current symptoms and help the client move toward developing new ways of coping. 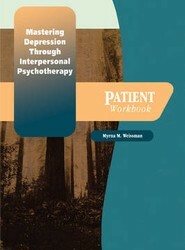 The books in this program clearly define the focus of treatment as "here and now."